Methods 3D, Inc., a newly formed subsidiary of Methods Machine Tools, Inc., a leading supplier of innovative precision machine tools, 3D printing technology, automation and accessories, showcased the new ProX™ DMP 320 at McCormick Place, Chicago, Illinois, September 12-17, 2016. The ProX™ DMP 320 joins Methods 3D’s growing line of direct metal 3D printers from 3D Systems (www.3dsystems.com). The ProX™ DMP 320 sets a new standard in metal 3D printing and is designed for high precision, high throughput direct metal printing and is optimized for critical applications requiring complex, chemically-pure titanium, stainless steel, or nickel super alloy parts. The ProX™ DMP 320 is designed for production manufacturing, with exchangeable manufacturing modules that support rapid material change or replenishment, allowing manufacturers to keep pace with demanding production cycles and enabling efficient powder recycling. The ProX™ DMP 320 offers a large 10.82″ (275 mm) x 10.82″ (275 mm) x 16.53″ (420 mm) build volume and is designed to handle critical industrial applications, including those in aerospace, automotive, and medical. The printer comes in two configurations, one optimized for titanium and one optimized for stainless steel and nickel super alloys. With centralized maintenance management, reduced argon gas consumption, and serial manufacturing workflow support, the ProX™ DMP 320 also offers competitive operating cost advantages. 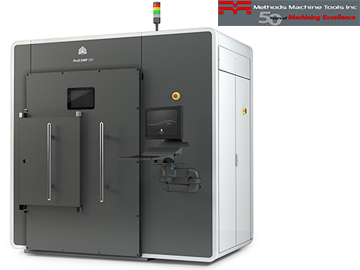 In October 2015, Methods Machine Tools announced it entered into a partner agreement with 3D Systems, a provider of the most advanced and comprehensive 3D digital design and fabrication solutions available today, including 3D printers, print materials and cloud-sourced custom parts. Methods 3D, Inc. is comprised of a dedicated team of industry experienced, highly-skilled technical sales and applications engineers fully integrated with, and leveraging, the extensive machining and manufacturing experience of Methods Machine Tools, Inc. This partnership enhances Methods’ portfolio of leading-edge precision machine tools and solutions for traditional manufacturing with advanced 3D printing solutions, enabling their customers to enter new markets, expand their manufacturing capabilities, and revolutionize manufacturing with 3D printing. Methods Machine Tools, Inc., in operation for over 55 years, is a leading supplier of precision machine tools, 3D printing solutions, automation and accessories, providing extensive applications engineering support, installation, parts, service and training through a network of large state-of- the-art technology centers and dealers throughout North America. For more information, visit their website at www.methodsmachine.com.